So, I put them on, realize it's too damn hot to wear jeans (even at 7:15 in the morning), take them off and wear cotton capris. I guess I'll have to wait for cooler temperatures. Which, anyway, I hope won't happen anytime soon! I hate when fashion gets ruined by weather! 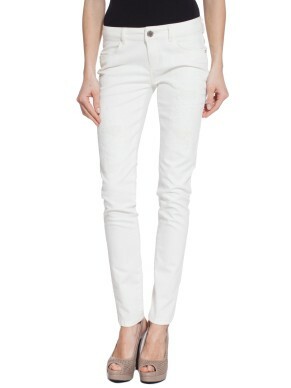 Love the white jeans and especially the 50% OFF - that is AWESOME! Hopefully, you'll have a cooler day soon to rock them! P.S. thanks for checking out my blog and all your sweet comments!